A big Thanks to all that helped make the 7th Annual Garden Walk a HUGH success this weekend! Once again our Gardens were spectacular, the weather co-operated, and the visitors were awed. What a wonderful way to showcase our beautiful City! I encourage more gardeners in the City to enter next year. We have so much to offer, so much to share. 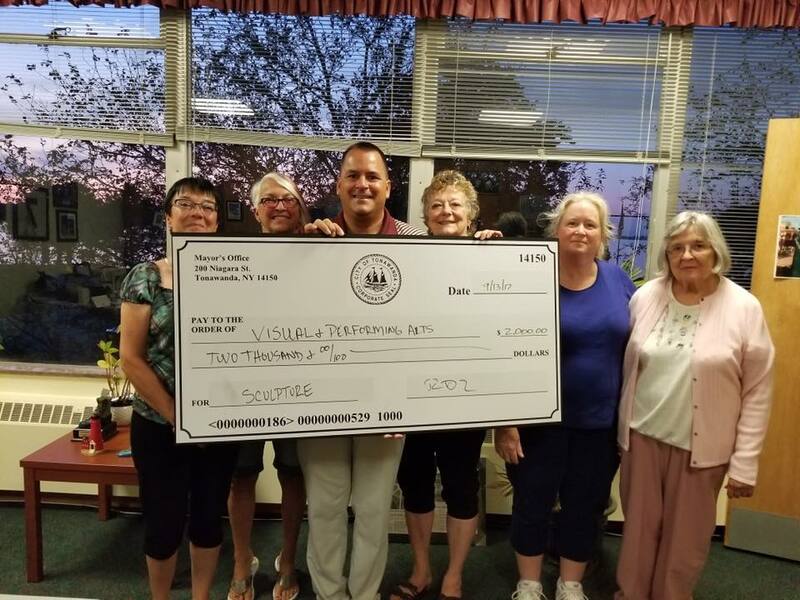 I want to thank the Members of the City of Tonawanda Visual and Performing Arts Board, whose hard work every year makes this possible, the Garden Club of the City of Tonawanda, and all our advertisers who help us make our endeavors successful. Stayed tuned for our next project, which is installing a “Little Library” down near Gateway Harbor!! Thanks again and enjoy your summer!! Thank you, everyone, for helping make the 2016 COT Garden Walk another fun and successful event! We had a great time and enjoyed welcoming you into everyone’s lovely green spaces. 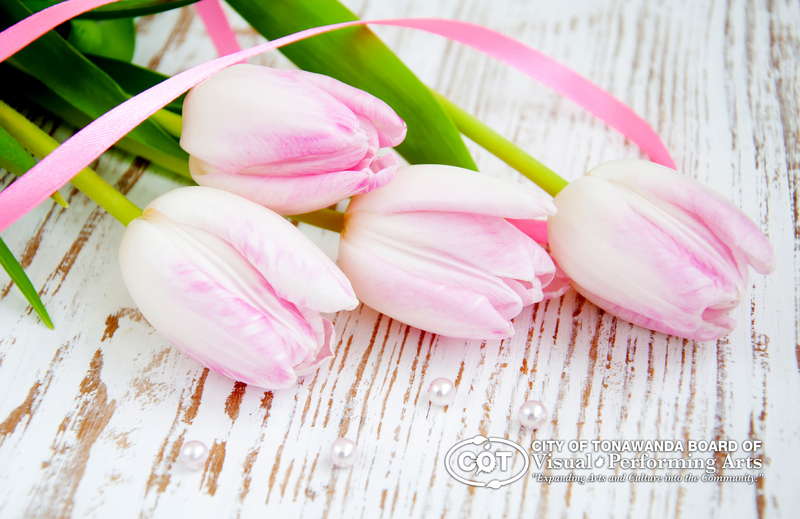 The Garden Walk is the City of Tonawanda’s premier fundraising event, and the culmination of months of planning, organizing, and hard (but fun!) work by a dedicated group of members and garden walk participants. 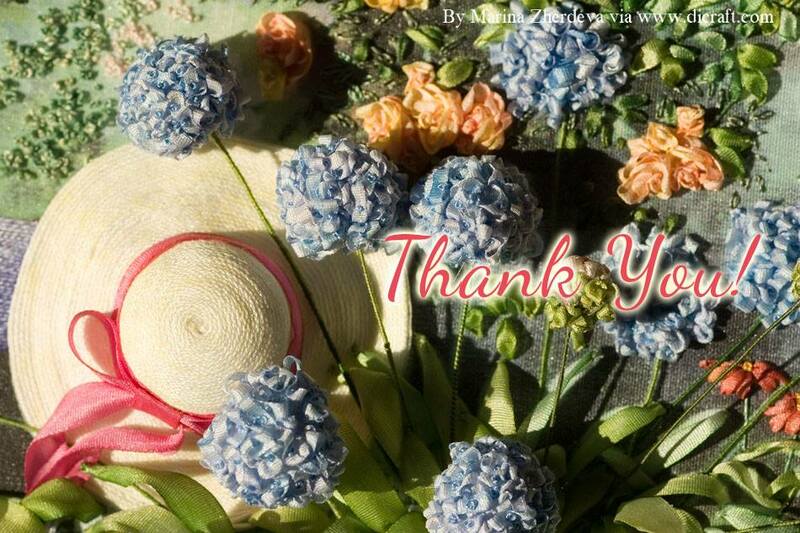 Here are to the people who made it happen — our garden hats are off to you! Tonawanda – The City of Tonawanda Visual and Performing Arts and Community Canvases have teamed up to create the “Paint Box Project” for the City of Tonawanda. 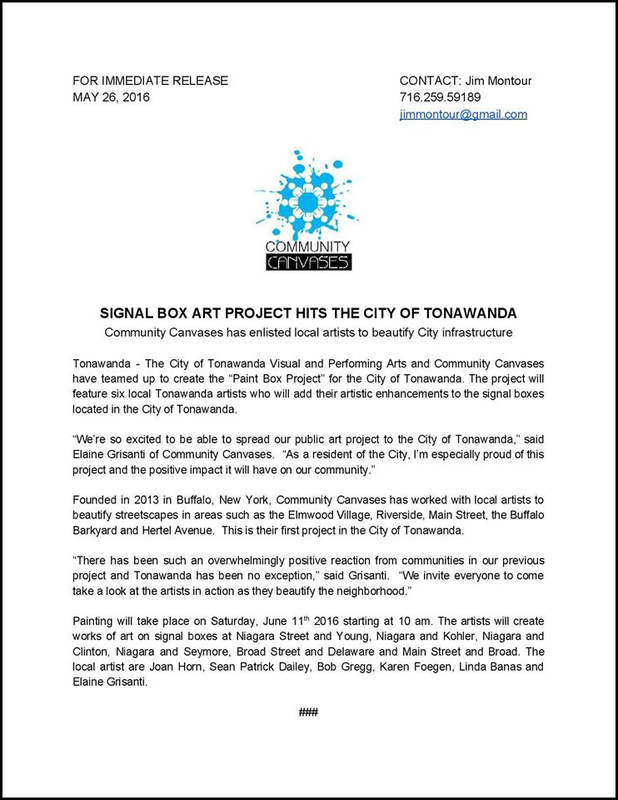 The project will feature six local Tonawanda artists who will add their artistic enhancements to the signal boxes located in the City of Tonawanda. Founded in 2013 in Buffalo, New York, Community Canvases has worked with local artists to beautify streetscapes in areas such as the Elmwood Village, Riverside, Main Street, the Buffalo Barkyard and Hertel Avenue. 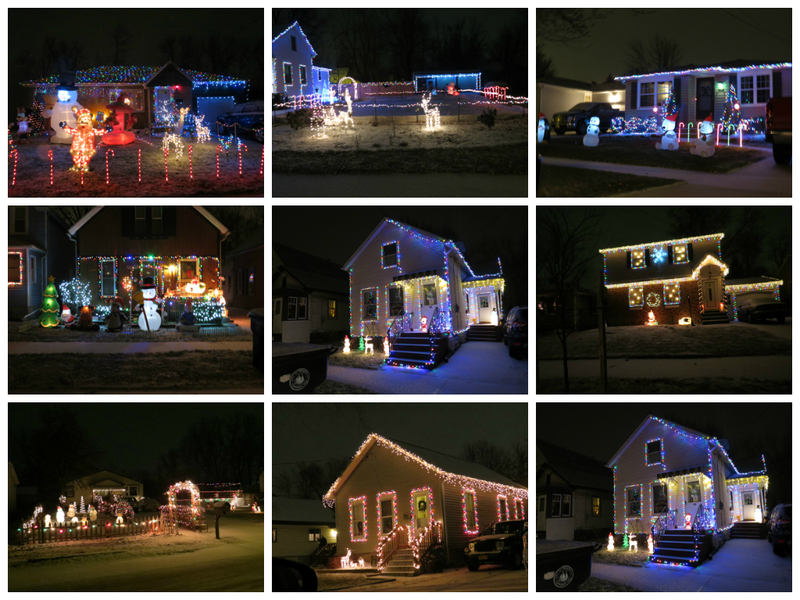 This is their first project in the City of Tonawanda. Painting will take place on Saturday, June 11th 2016 starting at 10 am. The artists will create works of art on signal boxes at Niagara Street and Young, Niagara and Kohler, Niagara and Clinton, Niagara and Seymore, Broad Street and Delaware and Main Street and Broad. The local artist are Joan Horn, Sean Patrick Dailey, Bob Gregg, Karen Foegen, Linda Banas and Elaine Grisanti. 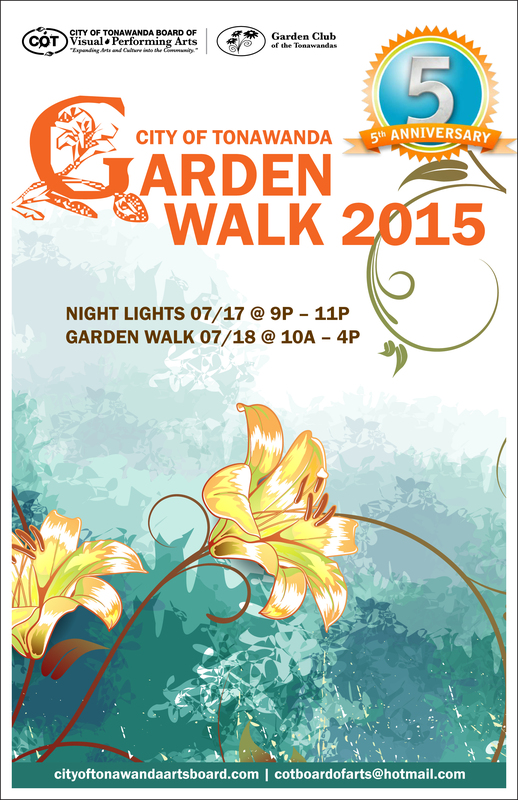 We would like to take a moment to thank all of our 2015 Garden Walk advertisers – Thank You! “A” Best Roofing & Siding Inc.
Big Bling: 163 DeKalb St.
Best of Show: 142 Grove St.
Board Choice: 228 Fletcher St.
Mayor’s Award: 345 Filmore Ave.